Mall Cops a Phone Call Away! Look closely along the top edge of the sign frame and you will see lugs built in to mount directly to Pegboard and most likely Slatwall too. 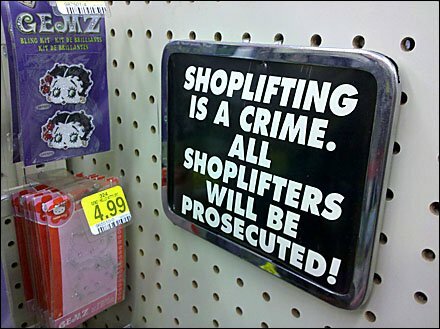 Rather than a single large sign far removed from the scene of the shoplifting crime, these small signs were posted in intimate range of the target items. The sign seems to be lecturing to the perpetrators very personally. I’ll bet the reminder on this level is effective. Even Betty Boop eyes the message nervously. And after all, the Mall Police are but a cell phone call away. “Regulating Retail Tag” for a scrolling list of discussions.